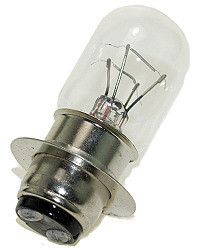 Browse for light bulbs by vehicle make and model. 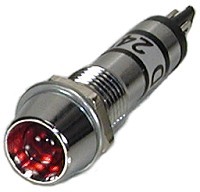 12 Volt high brightness output red LED power indicator lamp. Chrome plated brass base. Mounts into a 5/16" (8mm) ID hole. Includes mounting nut and lock washer. 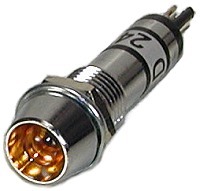 12 Volt high brightness output amber LED power indicator lamp. Chrome plated brass base. Mounts in a 5/16" (8mm) ID hole. Includes mounting nut and lock washer. 12 Volt high brightness output green LED power indicator lamp. Chrome plated brass base. Mounts in a 5/16" (8mm) ID hole. Includes mounting nut and lock washer. 12 Volt, 2.4 Watt, high intensity 48 LED electric scooter and bicycle headlight bulb. 2" outside diameter. Average bulb life 50,000 hours. Vibration and impact resistant. 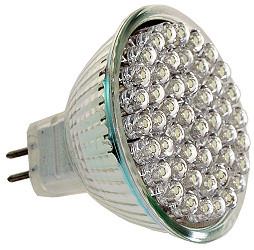 This LED bulb has an operating Voltage range of 6-17 Volts DC, so when the battery drops under 12 Volts it will not loose brightness intensity like conventional incandescent light bulbs do. 12 Volt, 3 Watt electric scooter and bike tail light and turn signal bulb. 12 Volt, 3 Watt red electric scooter and bike tail light bulb. 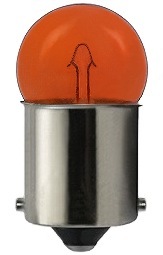 12 Volt, 5 Watt amber electric scooter and bike turn signal bulb. 12 Volt, 5 Watt red electric scooter and bike tail light bulb. 12 Volt, 5 Watt electric scooter and bike tail light and turn signal bulb. 15mm (approximately 9/16") wide base. 12 Volt, 5 Watt LED electric scooter and bike tail light and turn signal bulb. 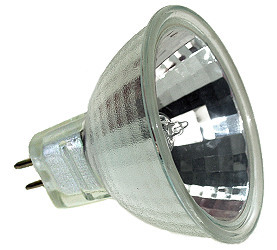 LED bulbs are unbreakable, shock and vibration proof, and extremely long lasting. 15mm (approximately 9/16") wide base. 12 Volt, 10 Watt electric scooter and bike tail light and turn signal bulb. 12 Volt, 10 Watt amber electric scooter and bike turn signal bulb. 12 Volt, 10 Watt electric scooter and bike headlight, taillight, and turn signal bulb. 15mm (approximately 9/16") wide base. 12 Volt, 10 Watt amber electric scooter and bike turn signal bulb. 15mm (approximately 9/16") wide base. 12 Volt, 10 Watt red electric scooter and bike tail light and brake light bulb. 15mm (approximately 9/16") wide base. 12 Volt 10 Watt / 5 Watt electric scooter and bike taillight bulb. Dual contact dual filament bulb. 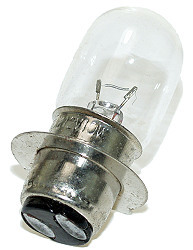 Bulb is marked 12V 10/5W. 15mm (approximately 9/16") wide base. 12 Volt, 10 Watt double contact, single filament electric scooter and bike headlight bulb. 15mm (approximately 9/16") wide base. 12 Volt, 10 Watt/10 Watt double contact, dual filament electric scooter and bike headlight bulb. 15mm (approximately 9/16") wide base. 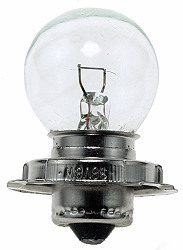 12 Volt 10 Watt/10 Watt halogen headlight bulb with clear glass lens cover. 2" outside diameter. 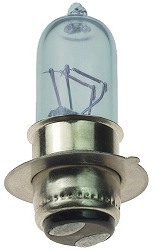 This headlight bulb fits headlight item # LIT-224. 12 Volt, 18 Watt/18 Watt double contact, dual filament electric scooter and bike headlight bulb. 15mm (approximately 9/16") wide base. 12 Volt, 18 Watt/18 Watt double contact, dual filament electric scooter and bike headlight bulb. 20mm (approximately 3/4") wide base. 12 Volt 35 Watt electric scooter and bike headlight bulb. Single contact single filament bulb. 15mm (approximately 9/16") wide base. 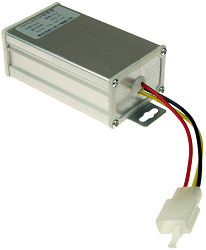 24 Volt high brightness output red LED power indicator lamp. Mounts in a 5/16" (8mm) hole. Includes mounting nut and lock washer. 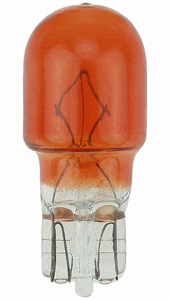 24 Volt high brightness output amber LED power indicator lamp. Mounts in a 5/16" (8mm) hole. Includes mounting nut and lock washer. 24 Volt high brightness output green LED power indicator lamp. Mounts in a 5/16" (8mm) hole. Includes mounting nut and lock washer. 24 Volt, 3 Watt electric scooter and bike tail light and turn signal bulb. 24 Volt, 3 Watt amber electric scooter and bike turn signal bulb. 24 Volt, 5 Watt electric scooter and bike tail light and turn signal bulb. 15mm (approximately 9/16") wide base. 24 Volt, 5 Watt LED electric scooter and bike tail light and turn signal bulb. Replaces and upgrades item # BLB-245 sold above. Brighter than standard 24 Volt 5 Watt light bulbs. 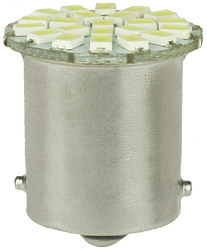 Contains 22 ultra bright white led emitters. Super compact design fits where standard light bulbs won't. LED bulbs are unbreakable, shock and vibration proof, and extremely long lasting. This may be the last turn signal or tail light bulb you will ever need to buy for your electric scooter or bike. 15mm (approximately 9/16") wide base. 24 Volt, 10 Watt electric scooter and bike headlight bulb. 15mm (approximately 9/16") wide base. 24 Volt, 10 Watt double contact, single filament electric scooter and bike headlight bulb. 15mm (approximately 9/16") wide base. 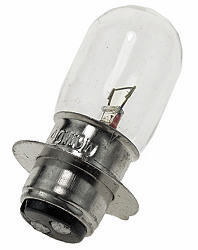 24 Volt 10 Watt halogen headlight bulb with clear glass lens cover. 2" outside diameter. 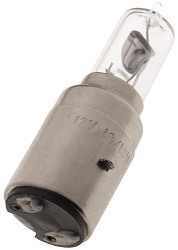 This headlight bulb fits headlight item # LIT-224. 24 Volt, 15 Watt electric scooter and bike headlight bulb. 15mm (approximately 9/16") wide base. 24 Volt, 18 Watt single contact electric scooter and bike headlight bulb. 15mm (approximately 9/16") wide base. 24 Volt, 21 Watt double contact, single filament electric scooter and bike headlight bulb. 15mm (approximately 9/16") wide base. 36 Volt, 3 Watt electric scooter and bike tail light and turn signal bulb. Bulb is marked 40V (40 Volts) and is designed for 36 Volt electric scooters. 36 Volt, 3 Watt amber electric scooter and bike turn signal bulb. Bulb is marked 40V (40 Volts) and is designed for 36 Volt electric scooters. 36 Volt, 8 Watt electric scooter and bike headlight bulb. 15mm (approximately 9/16") wide base. Bulb is marked 40V (40 Volts) and is designed for 36 Volt electric scooters. 36 Volt, 10 Watt electric scooter and bike headlight bulb. 15mm (approximately 9/16") wide base. Bulb is marked 40V (40 Volts) and is designed for 36 Volt electric scooters. 36 Volt, 10 Watt double contact, single filament electric scooter and bike headlight bulb. 15mm (approximately 9/16") wide base. Bulb is marked 40V (40 Volts) and is designed for 36 Volt electric scooters. 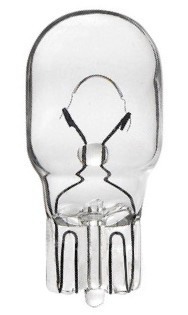 36 Volt 10 Watt replacement halogen bulb with clear glass lens cover. 2" outside diameter. 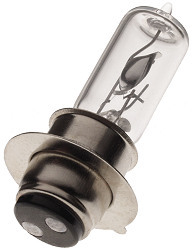 This bulb fits headlight item # LIT-236. 48 Volt 3 Watt electric scooter and bike tail light and turn signal bulb. 15mm (approximately 9/16") wide base. Bulb is marked 55V (55 Volts) and is designed for 48 Volt electric scooters. 48 Volt, 3 Watt electric scooter and bike tail light and turn signal bulb. Bulb is marked 55V (55 Volts) and is designed for 48 Volt electric scooters. 48 Volt, 3 Watt amber electric scooter and bike turn signal bulb. Bulb is marked 55V (55 Volts) and is designed for 48 Volt electric scooters. 48 Volt, 10 Watt amber electric scooter and bike turn signal bulb. Bulb is marked 56V (56 Volts) and is designed for 48 Volt electric scooters. 48 Volt 10 Watt electric scooter and bike headlight bulb. 15mm (approximately 9/16") wide base. Bulb is marked 56V (56 Volts) and is designed for 48 Volt electric scooters. 48 Volt 10 Watt / 5 Watt electric scooter and bike taillight bulb. Dual contact dual filament bulb. 15mm (approximately 9/16") wide base. 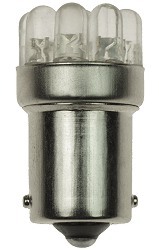 Bulb is marked 56V 10/5W (Replaces 55V 10/5W bulbs) and is designed for 48 Volt electric scooters. 48 Volt 18 Watt electric scooter and bike headlight bulb. Dual contact dual filament bulb. 15mm (approximately 9/16") wide base with collar. Bulb is marked 56V (56 Volts) and is designed for 48 Volt electric scooters. 48 Volt 18 Watt electric scooter and bike headlight bulb. Dual contact dual filament bulb. 15mm (approximately 9/16") wide base. Bulb is marked 56V (56 Volts) and is designed for 48 Volt electric scooters. 48 Volt 25 Watt electric scooter and bike headlight bulb. Dual contact dual filament bulb. 15mm (approximately 9/16") wide base. Bulb is marked 56V (56 Volts) and is designed for 48 Volt electric scooters. 48 Volt 25 Watt electric scooter and bike headlight bulb. Dual contact dual filament bulb. 20mm (approximately 3/4") wide base. Bulb is marked 56V (56 Volts) and is designed for 48 Volt electric scooters. 48 Volt 35 Watt electric scooter and bike headlight bulb. Single contact single filament bulb. 15mm (approximately 9/16") wide base. Bulb is marked 56V (56 Volts) and is designed for 48 Volt electric scooters. 48 Volt 35 Watt electric scooter and bike headlight bulb. Dual contact dual filament bulb. 15mm (approximately 9/16") wide base. Bulb is marked 56V (56 Volts) and is designed for 48 Volt electric scooters. The blue coating on this bulb gives it a bright white light and does not turn the light blue. 48 Volt 35 Watt electric scooter and bike headlight bulb. Dual contact dual filament bulb. 15mm (approximately 9/16") wide base with collar. Bulb is marked 56V (56 Volts) and is designed for 48 Volt electric scooters. 60 Volt, 3 Watt electric scooter and bike tail light and turn signal bulb. Bulb is marked 70V (70 Volts) and is designed for 60 Volt electric scooters. 60 Volt, 3 Watt amber electric scooter and bike turn signal bulb. Bulb is marked 70V (70 Volts) and is designed for 60 Volt electric scooters. 60 Volt 10 Watt / 5 Watt electric scooter and bike taillight bulb. Dual contact dual filament bulb. 15mm (approximately 9/16") wide base. 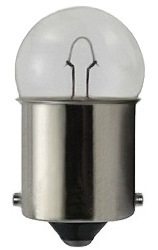 Bulb is marked 70V 10/5W and is designed for 60 Volt electric scooters. 60 Volt 25 Watt electric scooter and bike headlight bulb. 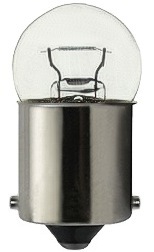 Single contact single filament bulb. 15mm (approximately 9/16") wide base. Bulb is marked 70V (70 Volts) and is designed for 60 Volt electric scooters. Whether you call them lamps, lights, or bulbs we carry a wide variety of them for all types of electric scooters, electric bikes, electric mopeds, electric go-karts, electric motorcycles, and most other small electric vehicles.